How was your weekend, girls? Mine was, enlightening – learned a new lesson – that it’s not a good idea to watch horror movies late in the evening, just before going to bed. Last night was spent all awake, praying, with lights on, just to ensure the Demon from ‘The Conjuring 2’ does not suddenly resurface and starts haunting my home and life! Anyways, watching a horror film in theater that too late in the night had long been on my list for ‘to do adventures for 2016’ and I’m feeling victorious to finally achieve it! Another “Eureka” moment I experienced in 2016 is – I can wear moisturizer in the peak of summer on my super oily skin – lesson learned – sometimes, an oily complexion is due to dehydrated skin and all you need is an oil-free moisturizer that balances the skin’s natural levels to remedy greasy skin. However, finding the best moisturizer for oily skin isn’t as easy. You have to kiss a thousand frogs before you finally find the perfect one suitable for your skin type and condition. And thankfully, I found my best match in – Aviance Hydra Balance Moisture Infused Advanced Serum – could that name be any longer? May be, if you read the full product description and ingredient list! Essentially it’s a hydrating serum with “bio-energised moisture-infusing complexes extracted from jojoba, almond, kiwi, wheat germ, cucumber, green tea, aloe vera and Vitamin C that penetrate deep into the skin to reveal its inherent luminosity”. Now this ingredient list sounds too tempting to ignore. But quite frankly, I didn’t buy this moisture serum for its impressive list of ingredients alone. I wanted to find a moisturizer for oily skin that hydrates without making the skin anymore oily or greasy. And Aviance moisture serum does just that, plus much more to help me get as close as possible to perfect looking skin especially in those most dreaded warmer months. “A powerful source of regeneration, the serum synergises plant extracts, Vitamin C, a selection of peptides, active ingredients and complex nutrients that are necessary for skin regeneration. Restorative and soothing, the Moisture Infused Advanced Serum protects and hydrates the driest skin, regenerating cells deep in the skin’s surface to dramatically boost its natural renewal process. 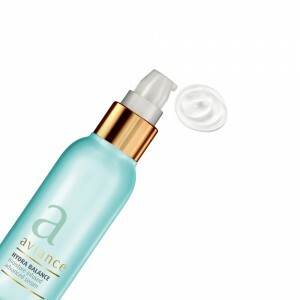 Aviance moisture serum comes in a small pale sea-green plastic bottle with a pump dispenser. The packaging looks luxurious and the pump dispenses just the right amount of product you need to use. As for the texture, it’s a super thin moisture serum that’s clear to opaque in color and runny in consistency. The scent is mildly floral and very feminine. Being lightweight, it feels like air and sinks into my skin quickly, while packing enough moisture for my oily skin. Just two pumps take care of my entire face and neck. The water based formula quickly evaporates to a smooth matte finish, thus giving me the freedom or power to use any sunscreen or makeup product over this serum. finally keeps my oily skin looking fresh like a mattifier! It’s been more than a month I’m using this serum and I feel the spells of dullness (when I skipped moisturizer) and excessive oiliness (on applying moisturizer under spf) I was experiencing before have reduced a lot. My skin stays fresh, smooth, and supple. 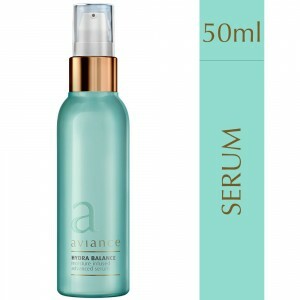 All and all, I would say Aviance Hydra Balance Moisture Induced Advanced Serum is a great moisturizer for oily skin. Do give this face serum a try if you have oily/combination skin. Because sometimes you just need a little moisture to break the cycle of oiliness and dullness. However, if you have dry skin, this serum alone is not enough and should definitely be followed by a rich moisturizer.